Google ex-CEO, Eric Schmidt, announced today that he will use the Senate subcomittee hearings into Google’s anti-competitive behavior to unveil the company’s latest product — the first resulting from Google’s takeover of Motorola. It’s called the Google DRONE, a flying personal assistant equipped with cameras and screens, and operated using a smartphone. Drone technology, first perfected in the tribal regions of Afghanistan, was enthusiastically embraced by President Obama once Google became a major sponsor of his campaign. Google, Oracle, and other technology companies helped the Department of Defense develop drone technology. Google outbid Oracle for trademark rights to “drone” as well as the supporting patents. Nowadays, the best drones under 200 bucks can be bought for a variety of personal uses – and any tech geek owns at least one model. DRONE stands for Digital Replacement for Neural Entropy. Schmidt says it is programmed to be “evolutionarily intelligent.” The device is rumored to currently have the intelligence of an ape. 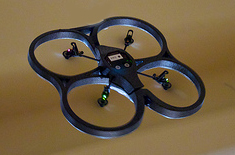 The operating system for DRONE is based on Evolutionary Linguistics, or EvoL. “DRONE is not currently as smart as human beings, but it’s learning,” Schmidt said. Eventually, the device will evolve to believe it is more correct than human beings. GoogleMinus, together with GooglePlus, will eventually be used to pilot the emotional engine in DRONE. The device glows red or blue depending on the “balance of suspicion,” or BS level, which Google calculates in real time using a proprietary algorithm. When asked about DRONE, Facebook CEO Mark Zuckerberg said his company has its own flying personal assistant in testing which includes Facebook’s face-recognition software. “You’ll not only know who is talking about you, but also what they’re saying, in real time,” Zuckerberg told a news drone. At Apple, interim CEO Eric Schmidt says Apple will counter DRONE with the iFly, a personal utility drone that’s so advanced it’s not just touch-sensitive, it’s thought-sensitive. The iFly is driven by pads attached to the temples that read brain waves. Finally, tech giant HP announced it will be hiring Eric Schmidt as interim CEO to spearhead a drone program there. HP’s stock closed up for the first time this year. Please “hate me” on GoogleMinus! Image courtesy of Mike Miley, used under its Creative Commons license.